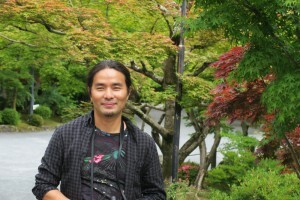 Jyoti Naoki Eri is a Japanese artist residing in Auroville – a universal township in making in South India. He studied traditional Japanese art as the foundation to his artistic career. He has used the strong traditional back ground to break barriers in his art and explore multiple techniques and mediums in his artwork such as; calligraphy, sculpture, water colours, ceramics, lacquer work etc. This research has lead him to believe that art can bridge and harmonise the dualities of existence. He seeks to create a new narrative dedicated to the future of humanity. “ I was born in an artist family in Kyoto, Japan. I started calligraphy study since age seven. Then started to learn figurative sculptures in a public art high school in Kyoto. In 1994 I became a professional wood sculptor through the apprenticeship in Tokyo. In 1999 I lived in London for 1 year to study Mahayana Buddhism and Western art in general. After that I came back to Japan and studied Buddhist image sculptures and traditional art in general at my birth place Kyoto until 2004. After some intensive art and religious studies in Japan, gradually my focus shifted to deeper spiritual awareness and insights. Then I decided to travel to Nepal, Tibet and India. I’ve visited many spiritual masters in different traditions to study Vajrayana Buddhism and Yoga. It was totally unexpectedly that I discovered Auroville (Tamil Nadu, India) a Universal township in making and decided to become a permanent resident of Auroville in 2005. I practice & teach art in general in Auroville. I also organise a collective cultural/social programs under the title The ONE ASIA project. Bob Zwicker gave me your reference. I work on Japanese history and will be in Pondicherry form 5-10 February. I am particularly in looking at Japanese cultural and aesthetic connections with India. I will be staying in the Ashram and hope you have some time to meet. Looking forward to your response, in English or Japanese.